Just think about all the little nuances of relationships that have taken place over a cup of coffee. And not just between people that are dating (or are in the process of reaching that status), but between friends, co-workers, etc. It's also funny how much meaning people have attached to grabbing a coffee together. I still remember when Patrick and I were getting to know each other and how he semi-asked me out on a date. It was after we'd gone in a group to see a drive-in movie that he texted me that night, asking if I wanted to grab a coffee sometime. Casual enough, right? I remember driving myself crazy (and probably my friends too) wondering what that invitation meant. Well, now I know, don't I? Haha, but it was such a good way to get to know each other in a more personal way. You can actually read about that first date here. Anyway, last Friday I met up with Kirsten on campus where we kickstarted our little hangout session with some Starbucks. I had the Eggnog Latte, and mmmm, that was tasty. She grabbed a little Pumpkin Spice Latte and we were set. It was so nice to catch up with that girl again. I always feel more light-hearted after having a good talk with her. That's a wonderful thing about having a close friend like that. We like to call each other "twin" because we tend to think the same things at the exact same moment. Haha, so we literally finish each other's sentences all the time. Also, as you can see, I found a new program to edit my photos with - collage style! I really like this new format, because I tend to take a lot of photos for each outfit, but cramming them all into one post can seem overwhelming when they have to be placed one right after the other. What do you guys think? I used Pic Monkey to make these, and I think I'm going to be using it for future posts. Here's just a tiny sample of their pretty options! I really love your outfit! It just screams Fall/Autumn! And I agree, coffee means so much more these days because now it is associated with being social. 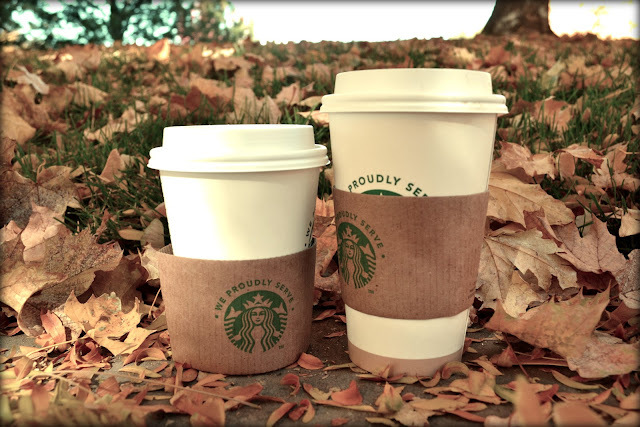 I personally love pumpkin spice lattes. I LOVE that having coffee means casual conversations! I actually don't drink coffee, but I LOVE smelling it and having conversations with friends at coffee shops! LOVE this outfit, especially the skinnies and the bag! I wish we had Starbucks in Luxembourg! I love their cappuccinos and lattes. Eggnog latte sounds sooo good! 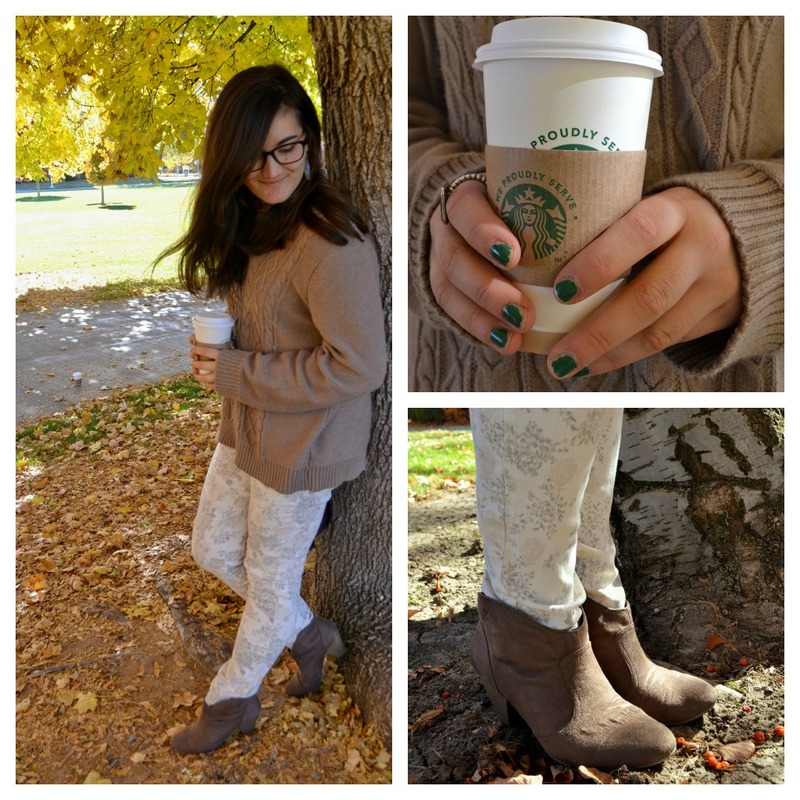 Love your pants- the print is so cute! And totally agree- it's always nice to grab a cup of coffee and catch up! hope you are well, sweetheart! I am loving how equally cozy and chic your outfit is! Makes me wanto to grab my fleece sweater and do the same things you did! 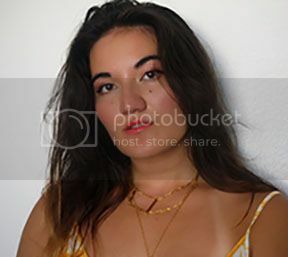 I am in love with the pictures! grabbing a coffee together means often a one-on-one conversation with someone without distractions and an opportunity to really get to know each other (or catch up). that's why it's so precious in my opinion! Really like your printed pants - the perfect colour to be worn so many ways :) Target has some great jeans, my leopard print ones are from there! Your jeans are absolutely awesome! Very beautiful! You're so right...theres always something more to the phrase, lets have coffee. Your photos came out lovely, super sweet jeans....I've never had either of those drinks before, they don't even make them here, sounds divine! that was really nice that you all got together. talking over coffee invites discussion and makes everything easier. people are very relaxed at coffee houses. love your floral jeans. very soft in print. love the picture collages. it's a great way to group things. Goodness, not only you are very stylish, but also so sweet and adorable!! This post made me smile, and warmed up my heart! and you and your friend both look gorgeous in these photos! Coffee dates are the best, literally my favorite thing ever. I LOVE these jeans, they look amazing on you. And I love that you guys match! Also, pictures are looking amazing, by the way! Love coffee dates, and LOVE those ankle boots! guh-reat outfit! love the subtle tone. oh i love coffee! Lovely photos, my dear! And awesome post! Love your pants and your nail polish! Coffee really does seem to bring people together! It's just casual enough to serve as a first date or a gathering of friends. 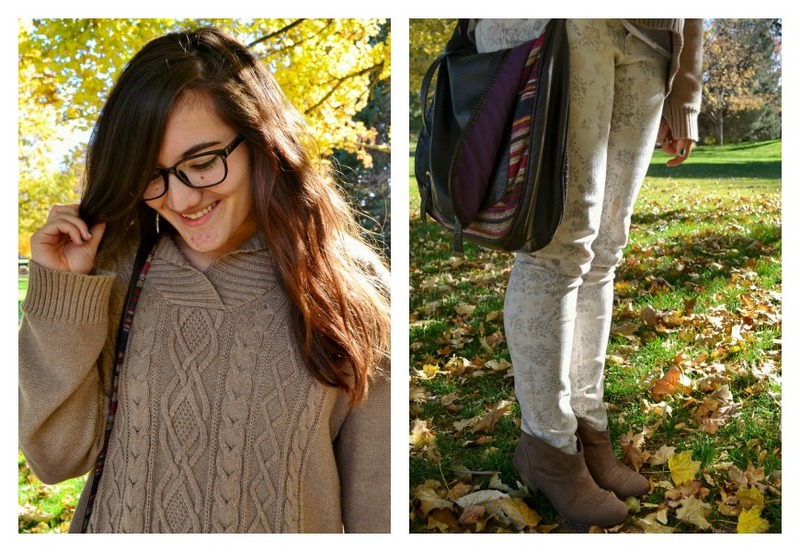 :) I love this fall outfit though! I have a similar pair of boots and I might try out a similar look! Those jeans are fantastic. Loving this look! All the colours are tied in so nicely, really loving those pants. love how comfy your outfit looks! love that sweater! I love a good Starbucks trip with a friend! And your jeans are so cute. 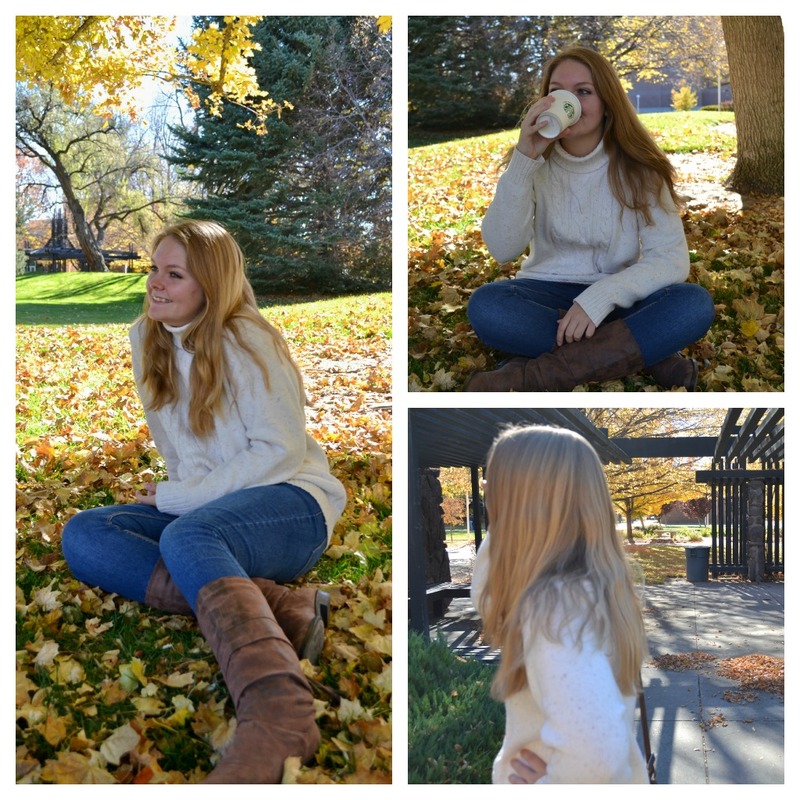 I just love coffee on these chilly days :) love your outfit by the way, perfect for fall. 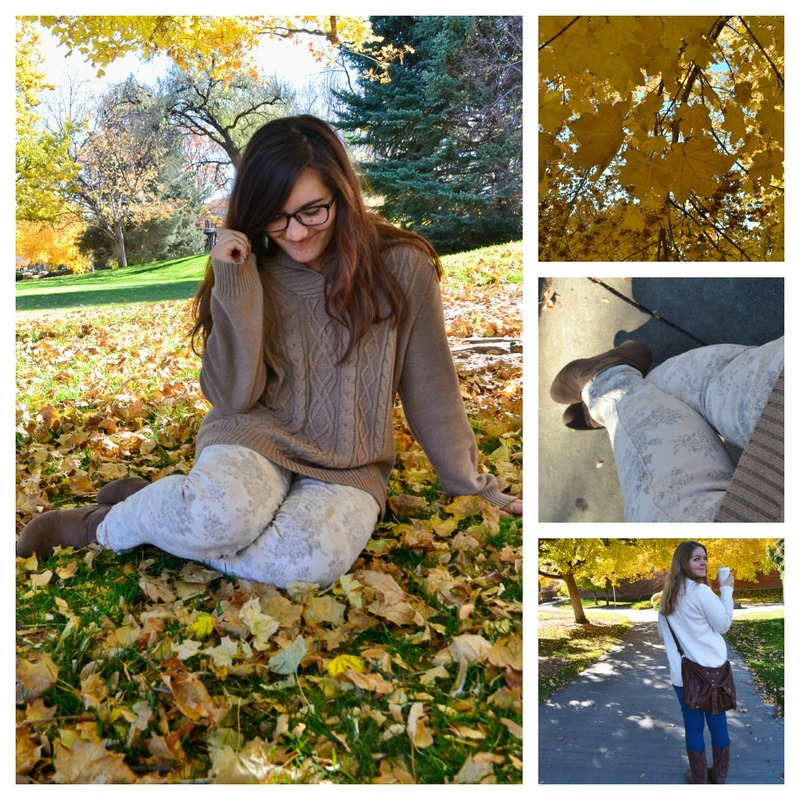 Beautiful pictures in the gorgeous fall leaves! You are so right about coffee though, why is it we always use coffee as a go-to meet up? Whatever the reason, I enjoy it!